Synthetic peptide within Human MDM2 aa 393-424 (C terminal) conjugated to Keyhole Limpet Haemocyanin (KLH). The exact sequence is proprietary. WB: Mouse lung tissue lysate and HepG2 cell lysate. ICC/IF: HeLa cells. 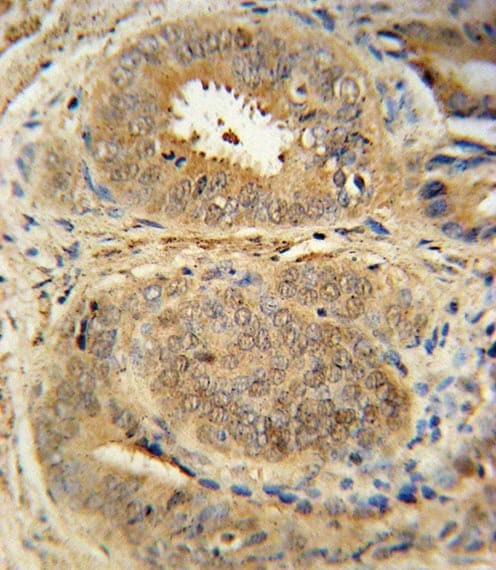 IHC-P: Human prostate carcinoma tissue. MDM2 human protein exists in 11 isoforms UniProtKB - Q00987, the immunogen of ab38178 corresponds to atleast 10 isoforms i.e. 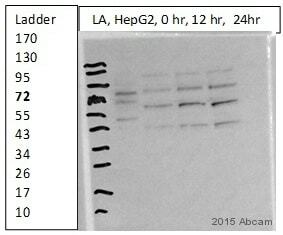 1,2,3,4,5,6 8, 9, 10 and 11; therefore the western blot results might show bands corresponding to these isoforms. This antibody is prepared by Saturated Ammonium Sulfate (SAS) precipitation followed by dialysis against PBS. Our Abpromise guarantee covers the use of ab38618 in the following tested applications. WB 1/1000. Detects a band of approximately 55 kDa (predicted molecular weight: 55 kDa). E3 ubiquitin-protein ligase that mediates ubiquitination of p53/TP53, leading to its degradation by the proteasome. Inhibits p53/TP53- and p73/TP73-mediated cell cycle arrest and apoptosis by binding its transcriptional activation domain. Also acts as an ubiquitin ligase E3 toward itself and ARRB1. Permits the nuclear export of p53/TP53. Promotes proteasome-dependent ubiquitin-independent degradation of retinoblastoma RB1 protein. Inhibits DAXX-mediated apoptosis by inducing its ubiquitination and degradation. Component of the TRIM28/KAP1-MDM2-p53/TP53 complex involved in stabilizing p53/TP53. Also component of the TRIM28/KAP1-ERBB4-MDM2 complex which links growth factor and DNA damage response pathways. Ubiquitous. 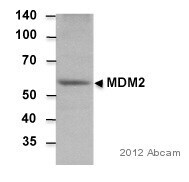 Isoform Mdm2-A, isoform Mdm2-B, isoform Mdm2-C, isoform Mdm2-D, isoform Mdm2-E, isoform Mdm2-F and isoform Mdm2-G are observed in a range of cancers but absent in normal tissues. Note=Seems to be amplified in certain tumors (including soft tissue sarcomas, osteosarcomas and gliomas). A higher frequency of splice variants lacking p53 binding domain sequences was found in late-stage and high-grade ovarian and bladder carcinomas. Four of the splice variants show loss of p53 binding. Belongs to the MDM2/MDM4 family. Contains 1 RanBP2-type zinc finger. Region I is sufficient for binding p53 and inhibiting its G1 arrest and apoptosis functions. It also binds p73 and E2F1. Region II contains most of a central acidic region required for interaction with ribosomal protein L5 and a putative C4-type zinc finger. The RING finger domain which coordinates two molecules of zinc interacts specifically with RNA whether or not zinc is present and mediates the heterooligomerization with MDM4. It is also essential for its ubiquitin ligase E3 activity toward p53 and itself. Phosphorylated in response to ionizing radiation in an ATM-dependent manner. Auto-ubiquitinated; which leads to proteasomal degradation. Deubiquitinated by USP2 leads to its accumulation and increases deubiquitinilation and degradation of p53/TP53. Deubiquitinated by USP7; leading to stabilize it. Nucleus > nucleoplasm. Cytoplasm. Nucleus > nucleolus. Expressed predominantly in the nucleoplasm. 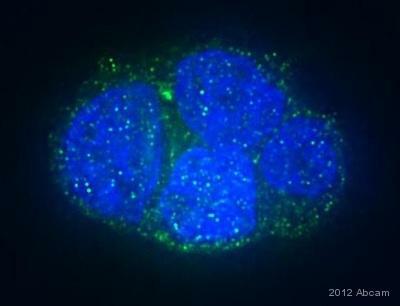 Interaction with ARF(P14) results in the localization of both proteins to the nucleolus. The nucleolar localization signals in both ARF(P14) and MDM2 may be necessary to allow efficient nucleolar localization of both proteins. Colocalizes with RASSF1 isoform A in the nucleus. 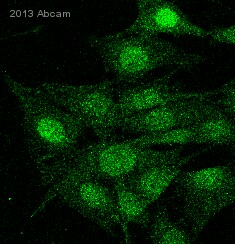 ICC/IF image of ab38618> stained HeLa cells. The cells were 4% PFA fixed (10 min) and then incubated in 1%BSA / 10% normal goat serum (ab7481) / 0.3M glycine in 0.1% PBS-Tween for 1h to permeabilise the cells and block non-specific protein-protein interactions. 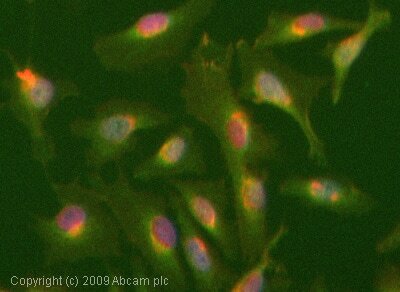 The cells were then incubated with the antibody (ab38618, 1µg/ml) overnight at +4°C. 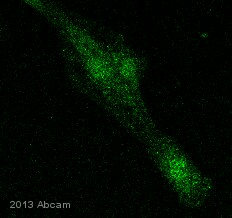 The secondary antibody (green) was Alexa Fluor® 488 goat anti-rabbit IgG (H+L)(ab150077) used at a 1/1000 dilution for 1h. Alexa Fluor® 594 WGA was used to label plasma membranes (red) at a 1/200 dilution for 1h. DAPI was used to stain the cell nuclei (blue) at a concentration of 1.43µM. Immunohistochemistry (Formalin/PFA-fixed paraffin-embedded sections) analysis of human prostate carcinoma tissue labelling MDM2 with ab38618. 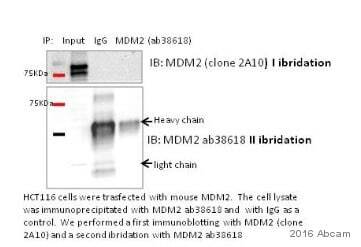 A peroxidase-conjugated anti-rabbit IgG was used as the secondary antibody, followed by DAB staining. Blocked using 5% Milk for 30 minutes at Room temperature. Antibody Dilutent was5% milk in TBS-Tween-20 (0.05%). Primary incubation 3 hours at room temperature. 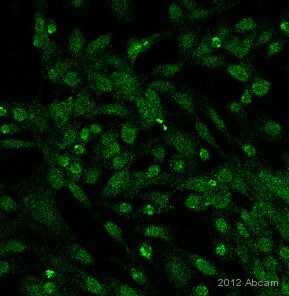 Immunofluorescence analysis of MDCK cells, staining MDM2 with ab38618. Cells were fixed with formaldehyde, permeabilized with 0.1% Triton X-100 and blocked with 1% BSA for 30 minutes at 25°C. Samples were incubated with primary antibody (1/100 in 1% BSA in PBS) for 1 hour at 25°C. An Alexa Fluor® 488-conjugated goat anti-rabbit polyclonal IgG (1/500) (ab150077) was used as the secondary antibody. 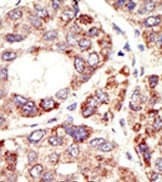 ab38618 staining human cancer tissue by immunohistochemistry, formalin-fixed, paraffin-embedded tissue. The hepatocarcinoma tissue reacted with the primary antibody, which was peroxidase-conjugated to the secondary antibody, followed by AEC staining. Incubation time was overnight at 4°C. Blocking/Dilution buffer: 5% NFDM/TBST. Publishing research using ab38618? Please let us know so that we can cite the reference in this datasheet.